When trouble comes, or something goes wrong, how often do we respond this way? Or do we react instead, taking it personally? Like it’s one more thing to fight. Paul writes these words in the midst of teaching about the right relationship and peace with God that we’ve received, the “undeserved privilege (verse 2)” we’ve been given through Christ. He highlights God’s great love for us, and our hope of salvation. In this context, it’s easier to see that he’s not asking us to somehow celebrate hardship. He’s giving us a different perspective on what’s happening, and showing a healthier response than our natural one. If salvation life is all about relationship with God, then problems and trials are opportunities to practice depending on Him. They keep us from drifting back to trusting our own strength. They develop our faith by letting us prove His faithfulness and power. They may be meant for harm, but God can use them for good. I’m learning to pray “use this” or “help me pass this test” – when I can notice what’s going on before instinctively reacting in battle mode. God our Rock and our Refuge, grant us spiritual sight to recognize the deeper realities in the trials and difficulties that You allow in our lives. Help us choose to rely on You, so that You can grow our endurance, our character, and our hope. Draw us deeper into relationship with You, for our joy and for Your glory. Hillsong United’s song, “Oceans (Where Feet May Fail)” reminds us where to place our hope. This entry was posted in Devotional and tagged circumstances, Devotional, Hillsong United, relationship with God, trouble on August 17, 2016 by Janet Sketchley. Daniel saw evil winning – permitted to win – but even then the heavenly beings knew this was only for a time. God had allowed it for a purpose. When things seem out of control, when God seems absent or not working… He still has the ultimate authority and He will work even this into His redemptive plan. There are things God allows as a consequence of our sin-soaked world, things that should never happen and that we wouldn’t allow if we had His power. The people living in these circumstances are suffering greatly. Knowing His goodness and the other aspects of His character helps us choose to trust Him even in the worst of times. At the Lord Jesus’ return, when everything is made new, when His glory is fully revealed and all tears cease, somehow He will make everything right. God our Creator and our Saviour, Your ways are beyond our understanding, and You are good. Help us trust You when we can’t see. Strengthen our faith to hold onto You. And we thank You that You will work everything out according to Your plan, and that it is a good plan, involving our salvation and our rescue. Thank You that Your glory will ultimately be revealed and Your people comforted, and that the enemy of our souls will be forever overcome. This entry was posted in Devotional and tagged circumstances, Devotional, God's power, God’s goodness, Steven Curtis Chapman, trouble on April 13, 2016 by Janet Sketchley. In Canada, we’ve recently seen what looks to many like another travesty of justice. And we see legislation in the making that has frightening possibilities. The US political scene has sent me to read the Book of Daniel. Around the world, terrorists spread hate and fear, innocent people are victimized, and the list could go on. We can echo Randy Stonehill’s plea, “Stop the World, I Want to Get Off,” but there’s nowhere else to go. And Jesus didn’t call us to hide, to sulk, or to turn nasty. I’m not sure what that should look like in my life. But when I think of living for God’s glory, and what that looks like: God didn’t write us off and turn away in frustration. He didn’t get bitter or resentful. In His anger at our sin, He remained righteous – and He made a way to restore us. As His followers, we don’t have the luxury of reacting to this world in the way that comes naturally – the way we think it deserves. We need to bring our hurt, anger, confusion, disappointment, fear, and the rest, to Him who judges justly (1 Peter 2:23). To the One in ultimate authority, whose plans will be fulfilled in His perfect timing. To the One who loves not only us but those still lost in the darkness. Anchoring our confidence in His character, His power and His purposes, we can conduct ourselves with hope and in a manner worthy of His name. Not by denying or ignoring what’s happening, but by remembering that this isn’t over yet, and that God is with us in the midst of it. God is our security. Whatever happens, He will be there. Our God, You see the darkness rising in our world, and yet You are at work behind the scenes to bring Your Kingdom purposes to pass. Give us the faith and the courage to rely on You and to shine Your light. Thank You that somehow You will work all this out for good and to reveal Your glory to the nations. Let Matt Redman’s song, “Shine,” be our prayer. This entry was posted in Devotional and tagged circumstances, Devotional, God's glory, Matt Redman, trouble on April 6, 2016 by Janet Sketchley. Do you see troubles as an opportunity? Maybe I’m still too much of a child inside, but I have the child’s response (mentally) of cowering and shrinking. Of thinking the trouble is too big, and fearing it will overwhelm me. Of seeing a threat. Another part of me raises my defenses. It’s a win-or-lose struggle, and I can’t afford to lose. James gives us a much broader perspective. Of course the pain and risk of trouble is great. (In verse 12 he talks about how “God blesses those who patiently endure.”) But he reveals a higher level of stakes. Trouble isn’t one more bout with a larger danger that will eventually overcome us, as if life is really out to get us. How can we reach a perfect state of needing nothing? By becoming fully reliant on our God, who we’ve discovered is all-sufficient for any trouble that threatens us. Will that happen this side of Heaven? Maybe not, but we can grow toward it. God who loves us and redeems us, please open us to see opportunity where our natural selves see only threats. Help us to allow the troubles in our lives to help develop our endurance. Give us the faith to trust You, so we can experience Your all-sufficient care for us. This entry was posted in Devotional and tagged circumstances, Devotional, endurance, faith, Matt Maher, trouble on August 5, 2015 by Janet Sketchley. Away from troubles and onto opportunity, joy, faith, chance, grow. He’s not telling his readers anything new. He says they already know it. We do too. But we get focussing on our troubles and we forget. We want to solve our problems, avoid the pain, steer out of the storm into safe harbour. James reminds us that the trouble, whatever its source, can be an opportunity for God to grow us. Trouble as a test of faith isn’t about do we pass or fail, do we have faith or not. James is writing to people who believe in Jesus. The test is to determine and reveal the quality and strength of our faith, not to disqualify us but to grow us. I think of it in terms of spiritual exercise. The more we use our “faith muscles” the stronger they become, and the more coordination and balance we develop. Father God, here is where we find the joy James talks about: growth and maturity in our faith. When we rely on You more than on ourselves, it draws us nearer to You and lets us experience more of Your strength in our lives. Thank You for Your grace and mercy to us and for Your loving presence that never leaves us. Our song this week is MercyMe‘s “Bring the Rain“. This entry was posted in Devotional and tagged attitude, Devotional, faith, MercyMe, trouble on May 29, 2013 by Janet Sketchley. One of the simpler and most familiar structures for prayer is ACTS. Not that we need a formula to approach God, but it can be good to have a guideline to keep from forgetting anything important. I’ve been using this one lately to stay focused, and have found some other benefits as well. I have a bad habit of starting prayer in mid-conversation. I know we’re encouraged to develop the habit of praying unceasingly, but when I stop for an intentional “quiet time” prayer, just me and God, it’s worth going back to the beginning to remind myself Who He is. It’s polite, reverent, and it quiets my heart and puts everything in perspective. Looking at God’s greatness is a great way to notice my own smallness and failings. Not that He wants to put me down – He can’t grow me in His image if I don’t see the problems and ask for His help and forgiveness. Regular confession helps me recognize the “little” sins that are easy to gloss over and allow to fester. Receiving His forgiveness erases any barriers my sin has caused that might keep me from hearing or obeying Him. How can I be anything but thankful that He forgives me and wants to help and heal me? Okay, “supplication” is too outdated a word for something that’s still current, so I call this part “struggles.” It’s the “prayer requests” part that too often we jump into without bothering with the other aspects. Coming after the other parts of the prayer, it’s in better perspective. By this point, I’m better focused on God, we’ve cleared up any communications issues, and I’ve looked at some of the ways He’s showed His care. I’m now in a good place to confidently bring Him needs: mine and others’. I suppose the S could also be for “surrender” because that’s the best thing to do with these issues. In bringing them to God, I need to release them with “not my will but Yours.” This is so much easier after spending a few minutes adoring, confessing and thanking, because I’m more aware of our relative positions and abilities. I’m less tempted to be sure I know best, and less tempted to doubt His care, integrity or power. The period also reminds me to stop talking and listen. Prayer is, after all, dialogue. If I fill the time with my yammering, I miss God’s quiet voice. ACTS. As well as the way this format helps me focus, I love how it can expand or contract to match the time I have for prayer. It’s a great way to start the day, and it puts me in an attitude of prayer that carries with me when I’m back in the fray. 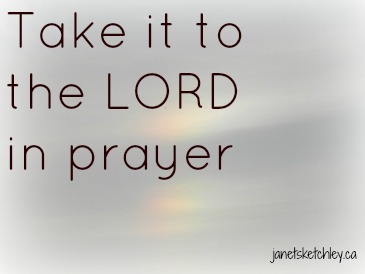 I still mess up, but even then if I’ve started well with prayer it’s easier to turn back to God and carry on. This entry was posted in Christian Living and tagged anxiety, circumstances, gratitude, prayer, trouble on November 23, 2012 by Janet Sketchley. The kindness of God has been on my mind a lot lately, and the depth of love He inspires when we see how good He is to us. I think that’s where the psalmist is going here with his question. Earlier in the psalm he talks about the hard place he was in, and how God answered his desperate prayer. There’s no way he can repay his Rescuer, except with his life. How then will he live? He’ll accept and embrace the salvation. No holding it off because he’s not worthy and can’t earn it. Neither will he keep it to himself. He’ll declare God’s praises publicly so others will know God’s character. And he’ll keep whatever promises and vows he makes to the Lord. I don’t think this is about any bargains he may have tried to make with God in the troubled time. I think it’s about integrity in his ongoing relationship with God and in the presence of witnesses. He also commits to be part of corporate worship as well as private worship. I’m not sure if it’s for his own need or in honour of God, but despite any irritating, flawed or hypocritical people in his faith community, he won’t walk away. His example of faithfulness and his declarations of praise will encourage others’ faith, and theirs will encourage his. As I pray for people struggling in the aftermath of Hurricane Sandy and other disasters, and as I pray for people digging themselves deeper into trouble of their own making, I’m sad that sometimes we have to reach despair before we cry out to God for help. Yet He’s waiting like the prodigal’s father, arms outstretched, longing to bring good into our lives. God, You are our Creator and Sustainer, our Saviour and our King. Your kindness reaches for us even while we’re running away from You. Soften the hearts of those who know You and of those who don’t, and help us all to look to You for help. Yes, we can fear Your discipline, but it’s when we experience Your love and Your mercy that our hearts are undone. We love You because You loved us first. Help us live in light of Your love. Todd Agnew’s song, “Kindness,” is one I’ve been singing in prayer for some of those I care for who are still running. May His kindness draw us all nearer. This entry was posted in Devotional and tagged circumstances, Devotional, God's love, prayer, Todd Agnew, trouble on November 21, 2012 by Janet Sketchley.